Stomach 36 is a really GREAT point everyone should know about. It is one of the most widely used acupuncture points on the body because it is so powerful. 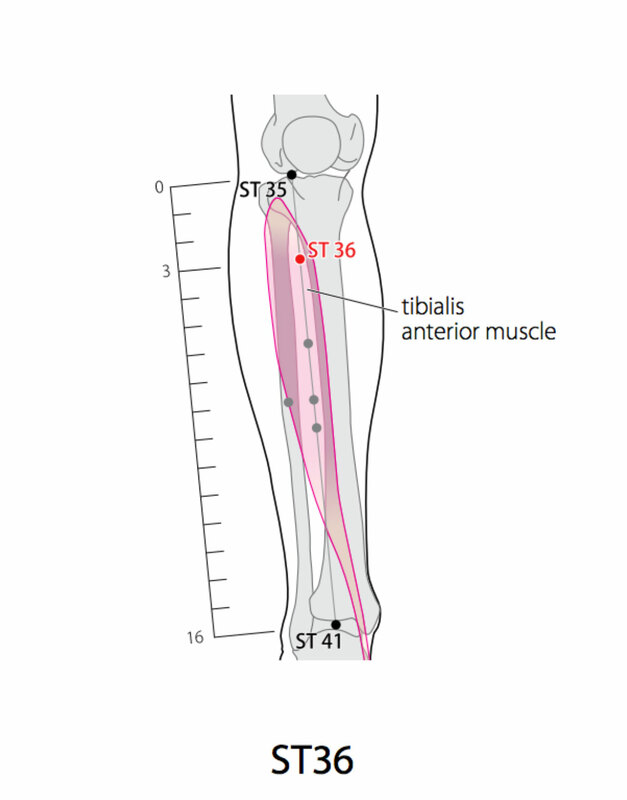 Location: 3 cun inferior to ST 35, one finger width lateral to the anterior crest of the tibia, in the tibialis anterior muscle. Attributes: He-Sea, Horary, and Earth point of the Stomach channel. Command point of the abdomen. Sea of Nourishment point. Lower He-Sea point, Gao Wu Command point, Ma Dan-yang Heavenly Star point. TCM Actions: Rectifies the spleen and stomach; regulates central qi; harmonizes the intestines and disperses stagnation; breaks thoracic blood stasis; courses wind and transforms damp; frees and regulates Qi and blood of the channels; supports the correct and banks up the origin; dispels pathogens and prevents disease. Needle Information: Perpendicular insertion .5 – 1.2 cun. Moxibustion is applicable. Thanks for catching that! We fixed it.